The best gift my dudes gave me for Mother’s Day was cuddling up on the sofa at Grandma’s, cracking open the newest Big Nate book: Big Nate Flips Out. It does my heart good that my dudes have reached the point where they’ll choose Momma reading to them at bedtime over anything else (including screen time). Anyway, I’ve been thinking about what our reading plan will look like this summer. Last year we transitioned from reading picture books to chapter books; which was met with opposition. This year will be easier. I hope. We’ve overcome the qualms of our oldest not wanting to read independently. As a matter of fact on our road trip to Grandma’s for Mother’s Day weekend, he spent two of the three hours’ drive reading. Woot! And we’ve moved our youngest past sight words to reading with confidence. He’s good at sounding out words he doesn’t know. His teacher tells us: “Wow is he a reader.” Yay! With less than four weeks left of school it’s that time again … and my list is already started thanks to soliciting titles from friends and family via Facebook. 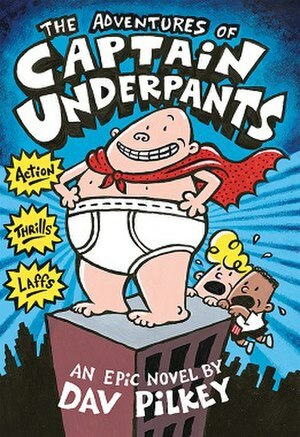 Captain Underpants – We’ve read all 10 and now have to wait for the next one to be published. Sweetfarts – Anything with bodily functions appeal to 8 & 6 year old dudes. We’ll tackle books 2 & 3 in this series. Big Nate – As I said we’ve just started the most current novel. Roscoe Riley Rules – The first 5 books were a Christmas gift. There are more for us to finish. George Brown Class Clown – Received 2 for Christmas. Again there are more to read which makes us happy. Geronimo Stilton – Surprisingly, they didn’t like the bright colors and font treatments as much as I did. Magic Tree House – Our oldest loved them when his teacher read them to him in school but lost the love when I read them at home. For my youngest we will invest in the Pigeon books by Mo Willems. He loves the snarky and indignant pigeon. Plus he can read them on his own. And, there are always more to come, like the books we stumble upon during bookstore visits. For me … I have more 20 unread books on my Kindle to work through and the list is ever growing. I can’t help myself. I download at least one book a day. Then, in a sneak attack mom move, I’ve told my oldest I will be reading the Secret Series by Pseudonymous Bosch; which I will because they sound like a load of fun; but I will buy physical copies just in case someone wants to dive in too. He said, “You should read it to us because we like mysteries.” Right! The idea of it being something for me and not for him has piqued his interest. Oh the reverse psychology! I didn’t offer it to him because his primary response to my book recommendations is rejection. We’ll see if he makes it to reading these. LOTS of options. A good book is only a click away for us. And amazon.com has a summer reading adventure map. Plus you don’t know where to begin they have recommendations by age group (including adult) for summer reading. Happy Reading! What’s on your book list? What will you read this summer? What will your little people read? Is This the Start of Something New? All images and content on this site are copyright the Jotter's Joint, unless stated otherwise. If you'd like to use any images or content please give proper credit and link back to this site.